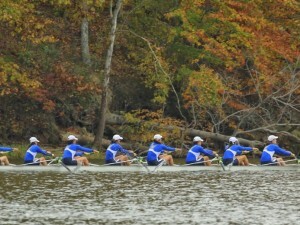 Ohio State University, Nova Southeastern University and Williams College claimed the top spots in the preseason USRowing/Collegiate Rowing Coaches Association Division I, II and III Collegiate Rowing Polls. Ohio State earned 13 first-place votes to top the preseason Division I team rankings. The University of California, Berkeley received two first-place votes to rank second, while the University of Virginia took the No. 3 spot in the poll and earned 10 first-place votes. The University of Washington and Princeton University rounded out the top five. Nova Southeastern University received five first place votes to lead the Division II preseason poll. Barry University and Western Washington University took the No. 2 and No. 3 spots in the poll. In the Division III poll, Williams College earned eight first place votes to earn the No. 1 spot. William Smith College finished took the No. 2 spot and Trinity College and Bates College tied for No. 3, with Trinity earning two first-place votes. Other Receiving Votes: Michigan State University 22, University of Oklahoma 21, Columbia University 17, Dartmouth University 12, Gonzaga University 6, University of Minnesota 5, Boston University 4, University of Kansas 4, University of Pennsylvania 3, Oregon State University 3, University of Texas 3, United States Naval Academy 2 and University of Miami 1. Other Receiving Votes: United States Coast Guard Academy 14, Rochester Institute of Technology 13, Lewis and Clark College 6, Colby College 3, Simmons College 3 and Hamilton College 1.